The Rockefeller Brothers Fund (RBF) is an independent, family foundation with almost 80 years of experience. What are the main program areas of the RBF? Stephen B. Heintz: We work on three global themes: strengthening the quality of democracy, promoting sustainable development, and advancing peacebuilding. In each of these themes we work not only in the United States, but also in various places all around the world. We combine our grantmaking in these areas with a great deal of traditional work, including: organizing meetings and conferences; supporting our grantees - with advice and with engagement - for their institutional capacity development; networking and building communities that have to work together to address very large challenges in this moment of political crisis. Your programs are implemented through a variety of approaches to grantmaking. Could you say a little bit about your supporting strategies? 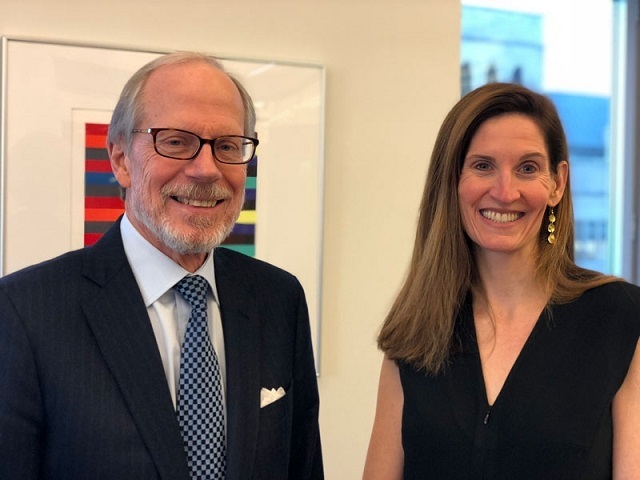 Valerie B. Rockefeller: Even though we work in a large variety of geographic locations, starting in the United States to globally, many of our strategies are similar. We always try to follow the need of the local partners and to advance the work of people or organizations who share our values, like the commitment to nonviolence, or the commitment to public-private partnerships, or who share the concept of sustainable development, for example, or what true democracy looks like. We do try to find those partners and give them as much support as possible in the way they need. As Stephen mentioned before, we host conferences and convenings to try to bring partners together and this is our most effective strategy to help grantees coordinate their work in order to make it more impactful. For sure, one of the most inspiring and powerful actions of the Rockefeller Brothers Fund has been the decision to divest from fossil fuels, announced in September 2014. It was a complex decision, wasn't it? A few years later, what are your ambitions in the field of sustainable development? Stephen B. Heintz: The decision to divest from fossil fuels was probably one of the most important decisions that we have made in the last ten years, maybe in our history. We have been working on the issue of global warming since the 1980s. We were among the earliest American foundations to recognize that global warming was occurring and that it needed a greater attention. So we began by providing grants to scientific organizations to continue and deepen the research, and then we have been supporting health policy, analysis and policy development work and activism to try to move the world to a clean economy and reduce dependence on fossil fuels on an urgent basis, in order to avoid the worst climate catastrophes that otherwise are likely to occur by the end of this century. We have been grantmaking on sustainable development for quite a long time and yet in our investments we continued to hold shares in fossil fuels companies, and this was frankly morally ambiguous for us. It was the equivalent as being a grantmaker supporting research in the lung cancer and investing in tobacco companies. So we began a discussion with our Board initially around the moral ambiguity, but we also quickly added economic analysis, based on the work of a very important organization in London: the Carbon Tracker Initiative. Their research - which was first published in early 2014 - indicates that if the global community has any chance to remain below 2 °C of warming by the end of the century, we as the global community have to leave 60 to 80% of the known fossil fuel reserves in the ground unburned, because if we extract them and burn them we will continue to warm the planet at an alarming pace. So that means that all the fossil fuel reserves, normally on the books of the major fossil fuel companies and the major energy companies, are “stranded assets” that will begin to lose value – they are in fact already losing value – and so to be invested in those companies that hold major assets in fossil fuel reserves, on the long-term, is a bad investment strategy. So the moral argument and the economic argument together achieved consensus among all of our stakeholders, most importantly the Board of Trustees which includes members of the Rockefeller family, making up the 50% of the membership of the Board. It was a historic decision and I'm glad that it continues to have significance in the divestment movement. Another impact is that we are talking to other foundations that are interested in examining our experience about how this affects our investment performance and advising them to think through a strategy that might work for them. Valerie B. Rockefeller: Even though we are working with other foundations to encourage them to divest from fossil fuels, I think it is important to show the scale of the movement. When we first joined the global divest-invest movement in 2014, it was worth about $52 billion of assets under management totally. By the Paris climate conference in 2015, a lot of institutions have put their money in the clean energy and now it is worth $6.3 trillion globally. This is a sign of how quickly the divestment movement has grown and how many different organizations and communities have joined it. Of course, we are proud as a foundation to continue pushing the movement forward. Our Journal has a special focus on arts and culture, so we are very interested in your program that supports creativity, artists and cultural organizations. Why did you decide to support culture and what sort of projects are you doing in this area? Stephen B. Heintz: We believe, quite passionately, that arts and culture inform and enhance the quality of human experience and bring a unique perspective to all the other issues we care about, that helps us examining ourselves and our society. Moreover, the arts brings people together around different visions of what the future can be. Arts and culture are really the very exciting part of our work, focused on New York City’s cultural communities. Of course, in New York we are very fortunate we have such a rich and diverse cultural scene, with all kinds of small and large organizations – experimental and traditional – in every artistic discipline which attracts a global audience. In line with this, a particular area of work in terms of our grantmaking is the support to the smaller and mid-size cultural organizations in neighborhoods throughout the city, that both reflect our society and serve the unique cultural communities and the diversity of the city’s population. We try to help build the institutional capacity of these small organizations; we try to help them attract larger audiences to their work and then we also offer the opportunity for artists' residencies at our Pocantico Center, which is outside New York City in the beautiful community of Pocantico Hills, New York. This is on the site of the Rockefeller family's former estate and itself has a magnificent collection of artworks and sculpture, where we host artistic residencies in all kind of disciplines and where artists have a chance to live on this beautiful campus and create new work. They have also the opportunity to present the new works to the public on site. This is a wonderful addition to our grantmaking: we give New York-based artists the opportunity to work in an absolutely beautiful natural environment, create new work, present the work in progress outside the city, come back to New York, continue the work on it and then present it to the global audience. We've already seen in two years we have been doing this, some really extraordinary new works of art in dance, in music, in composition, in poetry, in playwriting, and this has been very exciting. For instance, one dance company that we hosted for residency, The Black Iris Project, created a new piece of choreography based on the life of Nelson Mandela in South Africa and some months after the residency, performed it in world premiere at the Kennedy Center in Washington, D.C. That is a very nice example of how this opportunity for creative people works. Valerie B. Rockefeller: I want to say that the goal in all of our work is that we try to give voice to those who need to have greater representation in society. So it's the human expression for that sake and we support the creative process in order to provide opportunities for artists of color and other underrepresented artists to contribute to the cultural vitality of New York City. In your opinion, should arts play a more relevant role in order to educate civil society about climate change and the consequences of global warming? Stephen B. Heintz: Well, I am always very keen when artists, whatever kind, use their creative energy to call attention to very important societal problems. But I am also very hesitant to tell artists what they should do, because the creative process comes from within and I think that is very important for artists to have the independence to get true-to-life experiences and then to express their experiences through their art. Clearly, global warming is affecting all of us and we are seeing more and more artists involved in educating the public, inspiring the public and calling out the urgency of this issue and I think that is terrific. But we do not in our own grantmaking ever look to influence the content of the arts that our grantees and partners are producing. We actually look only at the quality of their works and at the originality and creativity of their proposals and we fund what we think is the most exciting creative work that we can find. We live in a time of insecurity characterized by the highest level of disparity between the rich and everyone else for the past half century. In such a context, what are the main challenges faced by the philanthropic sector today? Valerie B. Rockefeller: I'd like to say we look at social justice more broadly. We look, for example, at the impact of climate change – that it is greater on those who are already in trouble than on the rich that contribute to climate change – and at inequality and its effects on democracy and on the people who have less money and poorer connections. This is why we do a lot of work in trying to make sure everyone has the right to vote and to develop economic opportunities for marginalized populations. I think we have to overcome economic inequality as a goal of ours and we address it through different strategies and approaches. Stephen B. Heintz: I think that's right. In fact, over the next days we will have a meeting with the Executive Committee of our Board of Trustees and one of the items on the agenda is to review, and I hope, to set minor revisions to the grantmaking guidelines in our democratic practice program. One of the revisions is to make a little bit more explicit our concerns about economic inequality and as well as racial justice. The two of course are linked, but they are not synonymous. It's a very interesting challenge for philanthropy, because of course we exist as a result of the economic inequality, we exist thanks to the creation of great wealth and the success of individuals and families in their businesses. I don't mean in anyway to detract from what they have accomplished, but at the same time it is a reflection of the enormous private wealth and the fact that some of this capital goes into philanthropy is an extraordinarily positive thing. But we all have to keep in mind that creating the wealth is often a condition that disadvantages other populations in our societies. As American or European citizens we tend to take democracy for granted. But, the rise of nationalist parties and populist movements all across the Western societies puts the democratic systems and governments at risk. Are you worried about the future of democracy in the USA and Europe? How can we reverse this trend? Stephen B. Heintz: We certainly are worried about the future of democracy in our own country. We are also concerned about the future of democracy around the world as a matter of global governance. We need to make global decision making, global problem solving, global problem management more democratic, by which I mean more transparent, more accountable and more inclusive. My personal view is that the practice of democracy, as we now experience it, is anachronistic: the challenges of the 21st Century are challenges for which the original systems of democratic governance are no longer adequate and we need to re-invent and reform the systems in order to make democratic governance more effective, more inclusive and more fair. We have experienced, especially in this country over the last 40 years, a low process of democratic erosion in which very powerful economic forces have gained more and more power, while citizens have increasingly lost power. So today we see the influence of money in our politics, we see the power of lobbies or corporations and other special interests in the outcomes of the legislative process. We can see that many citizens have lost space in the democratic institutions and in the democratic process, because they feel that their engagement with it - their democratic participation – has a very limited impact and so they have lost confidence, have lost trust and have lost agency. So it is approaching a crisis; it is a very seriously problem and we have a lot of work to do to rebuild the democratic political culture on which effective democratic institutions stand. And then we have a lot of work to do to reform the institutions and processes, which - in my view - can only happen with the more robust culture in which citizens are really engaged and effective. Although the willingness of institutional philanthropy is to take risk, the general and widespread perception is that in practice most foundations are conservative and are not completely aware of the importance to be innovative. According to you, how important is it for foundations to take risks? Valerie B. Rockefeller: I think we have a unique tradition of taking risks and I agree with Stephen that we have to think very carefully about inequality. But the very first thing we can do is to take risks with that money because we are not like politicians, governments or businesses that have to win votes or have to make profits and they worry so much about whatever everyone else thinks. We have a unique freedom and we are able to follow our values and our own strategies. We do it and we are taking a lot of risks where we think we can have an impact that can spread to the rest of society. I think it is our moral obligation to take risks, and if we want to be effective in spending the money well, we have to think very carefully about the risks we take. Stephen B. Heintz: Valerie has said very well. We really believe that risk is one of our assets and we can take risks in a way that others cannot in the private sector or in government: to experiment, to try new things, and sometimes to fail when we do that, in order to come up with creative solutions to very difficult problems. The US is often a benchmark for foundation sectors around the world. As a long-lasting American foundation, what sort of advice would you give Italian family foundations? Stephen B. Heintz: I would like to say three things, although there are many things all foundations should have to keep in mind to conduct their work and develop it for the future. First, I think it's essential that foundations embrace their values and really discuss the values that are going to guide their work. Of course, in family philanthropy, this really comes from the values of the families themselves and it is important that there is clarity about those values and that they are communicated to everybody uses them to guide the work of the foundation. Second, our experience over 80 years now almost is that involving non-family members alongside family members in the management of foundations is a very effective way to increase effectiveness and high performance. You have to make sure that the non-family members who are involved share the same values that the family shares. You have try to involve people who can bring particular expertise and experience to the work of the foundation, as they can serve in a variety of roles - they can simply be advisors or they can be professional staff or even members of the Board. In our case, as I indicated early, half of our Board are members of the Rockefeller family and the other fifty percent are non-family members with expertise and skills that help our work. The third thing I would like to say is that it is really important to scale your specific area of focus, such as arts and culture, or the environment, or any other particular area of focus. It's important to scale those areas and your ambitions to the scale of your resources. We as a sector are extremely small and we have to acknowledge, with humility, that we do not have all the answers to many very big problems. But we do have some resources that can help people work on solutions. And I think it's important that we are bold in our ambitions, we are reaching toward significant goals, we are trying new ideas, we are experimenting. But we have to be very humble in our approach, understanding what we and others can bring to the process with the real willingness to learn from others and to learn from experiences as we go forward.